Awesome. 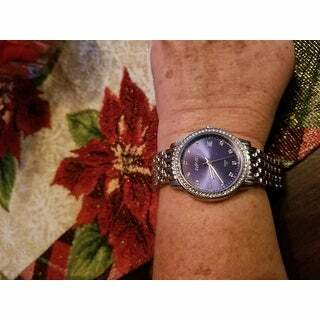 Its a beautiful watch my friend loved it. I work in an office and it dressy enough yet casual. I have gotten so many complements on it. I highly recommend this watch!! Bonus was getting a bracelet for free!!! Love it!!! 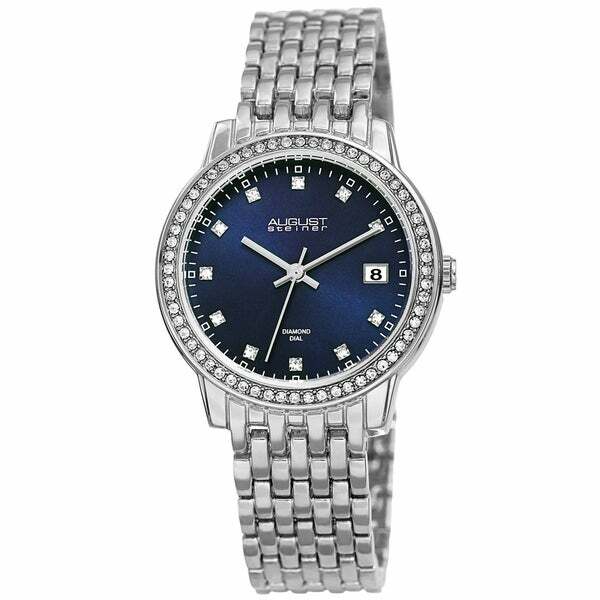 This August Steiner Sparkling Diamond Crystal watch is nearly perfect. I was looking for a watch with a large easy to read w/o reading glasses that can work in all occasions (except scuba diving perhaps). I love it, except that I will need to go to a jeweler's shop to see if the band can be made smaller. I have to say the watch would make a nice gift as it's box and presentation was somewhat impressive. I wouldn't recommend this for another girl with delicate wrists as the face is large. The face suited my needs and I love the blue face. Pretty watch, easy to see time. The blue face is a nice dark blue with crystals around the face. Had to have a few links removed to fit my wrist and now looks great. Somewhat hard to open at first but you have to pull hard to open one side while holding the other side of the bracelet. Takes some practice but once you figure it out its not a problem. I prefer that it is somewhat hard to open since I have a designer watch that I paid a lot of money for and the bracelet keeps opening so I'm afraid to wear it. So this watch has a similar look but with a blue face. I'm happy with my purchase because I didn't have to spend thousands to have a nice designer look. I am so pleased with my new watch that I received. First off I love that I have received all my orders in a timely manner, This was no exception to my experiences. The watch is really pretty and the quality is a 10. I really like that I can wear it for casual wear or when I get dressed up as well. I highly recommend buying this watch, you won’t be disappointed. The navy background is a refreshing change to all of my other watches. It runs generous in band size so you may need to remove a link as I did. I ordered this watch in the rose-tone, and it's really pretty. The only reason I gave it 4 stars instead of 5 is that the deployment clasp isn't as easy to use as one I have on a Fossil watch. That is my only complaint, though, and the watch fits loosely enough that I can usually slip it over my hand to take it off, so I like wearing this watch with rose gold jewelry. I love this watch, it's beautiful! The price was great, the date is easy to read and the face is such a pretty blue, looks great with my Tanzanite ring! The watch was huge and way too big for my wrist. I am returning it and looking for a different one. Pretty watch but very hard to unlatch the band. This watch is absolutely gorgeous - I only gave it 3 stars because it is extremely difficult to open and close. It took me an hour to figure out how to open it the first time. Now that I know how, it still takes some time to manage it. I purchased this for my wife, it is perfect. very nice, keeps perfect time. Super watch,exactly what I wanted. Arrived very quickly and I put it on right away. So beautiful that I hope it lasts a long time. I really like this watch. While the face is bigger than I thought it would be from the pictures, it is still very feminine and easy to wear. The quality is nice, and I get lots of compliments. I would recommend! I love this watch! I normally never splurge on myself but I loved the looks of this watch. When I got it I was not disappointed! "Can the band have links taken out to make it fit a 6 in wrist? 6.5 in watch." "Is this a large face watch??" I like color of face. I’ve been looking at these for a little and just decided to go ahead and buy it. I love the blue face on it.